I made this recipe about 2 months ago - I'm a bit behind on blogging! Luckily I made some notes so I wouldn't forget what I did! 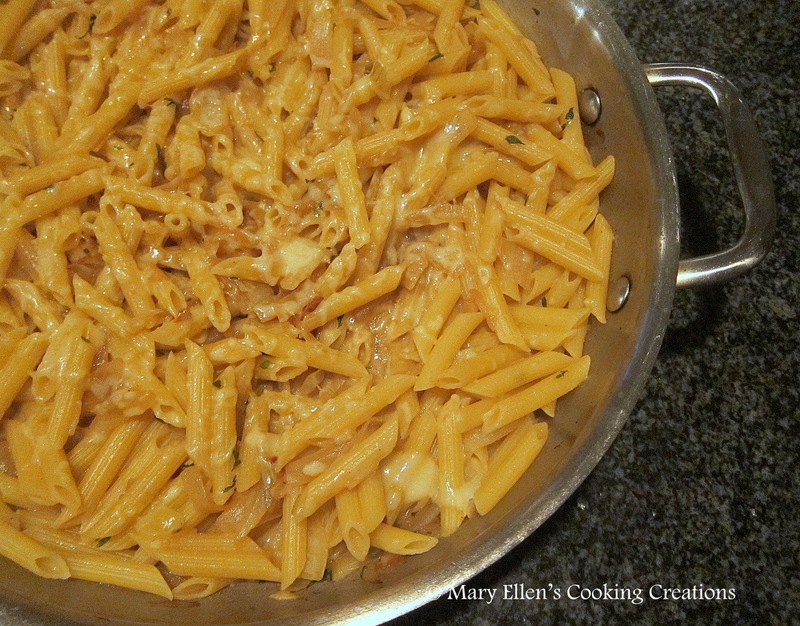 A while back, I pinned a recipe for French Onion Pasta found on the blog Stephanie Cooks. I took a few things from that recipe, and a few ideas from this French Onion Braised Chicken, and pulled together a quick and tasty pasta dish. It was really good - tasted like French Onion Soup with some pasta! I think adding shredded chicken and even some spinach would make this a complete meal. Heat olive oil and butter in a large, oven-safe saute pan over medium heat. Add the onions and sugar. Stir almost constantly until they turn a rich, golden brown color, being careful to keep the heat low enough so they do not fry or burn. At the end, add the dried thyme. This will take about 20-25 minutes. Add the garlic and soup mix; stir. Turn the heat up a bit and add the brandy, stirring to scrape up any brown bits. At this point, turn the broiler on in your oven. Add the cream and a handful of cheese, stirring until the cheese has completely melted. Add the pasta and parsley, stir. Season with salt and pepper, if needed. Top with cheese and place under the broiler until the cheese has melted. I'm a huge fan of French onion soup and a huge fan of pasta. Win win!